3D printing for textiles is a new form of printing gaining popularity in the fashion industry. 3D printing often uses solidly structured materials such as plastics and polymers to print 3D objects, however new innovations in the 3D printing industry are allowing fabrics to be printed from 3D printers. Fashion designers are also utilizing 3D printing to showcase brand new forms of fashion and transform the fashion industry as a whole. There is a lot of research and development going into new types of 3D fabric printers and these companies can take advantage of the R&D tax credits. Eligible costs include employee wages, cost of supplies, cost of testing, contract research expenses, and costs associated with developing a patent. On December 19, 2014 President Obama signed the bill extending the R&D Tax Credit for the 2014 tax year. A similar extension is expected for 2015. Electroloom, located in San Francisco, founded by Marcus Foley, Aaron Rowley and Joseph White, is the world's first 3D fabric printer. The Electroloom is a tool for designing and manufacturing custom 3D fabrics using CAD (computer aided design) technology to design a pattern and a solution of polyester/cotton blend to create the fabrics. A 3D mold of an object such as a shirt, is designed and an electrospinning process is used to convert liquid solution into solid fibers which are then deposited onto the 3D mold. When the process is complete, the fibers will have been formed into a single, seamless piece of fabric that preserves the shape of the mold. Besides just creating 3D fabrics, Electroloom also has a goal of creating a more sustainable textile industry. The Electroloom simply takes raw material into a finished good so there is no extra fabric. The materials are biodegradable and the process reduces carbon emissions since nothing needs to be shipped. Electroloom has raised $82,344, which is $30,000 more than their $50,000 Kickstarter goal. As a reward for donations, they are shipping tank tops, skirts, and even their Electroloom Alpha (a starter kit for the Electroloom). As a startup company, a large amount of innovation and development is occuring at a rapid pace. Electroloom is currently working on colored fabrics as well as expanding their range of 3D printing materials such as a silk and acrylic blends compatible with the Electroloom printer. 3D printed textiles are typically stiff and rigid. Nervous System, a design studio located in Somerville, MA, has created a process that gives the fabric movement and isn't so inflexible. Nervous System uses a process called Kinematics which combines origami techniques with novel approaches to 3D printing. The Kinematics process started in 2013 when Nervous System was hired by Google and Motorola to create 3D printing generators. After continuing development on the Kinematics software, the Kinematics Dress was created. Similar to the Electroloom, the Kinematics clothing is designed as a 3D model using CAD programming. The 3D model is then broken down into tessellated, triangular segments of varying sizes. Designers can then control the size, placement, and quantity of the triangles and use algorithms to add hinges to the triangles joining the triangles into a single garment. Nervous System's most famous piece is the Kinematics Dress that was printed at Shapeways, a 3D printing marketplace. Printed as a single folded piece, the dress flows and moves like a dress made out of fabric. The dress was acquired by the Museum of Modern Art along with the Kinematics software for their permanent collection. Another innovation within the 3D printing industry is Disney’s Fabric Printer. Disney Research has partnered with Cornell University and Carnegie Mellon University to work on a Layered Fabric 3D Printer. The Layered Fabric printer prints objects using two different fabrics simultaneously. Each layer of fabric is cut using a laser and then bonded to the previous layer using a heat sensitive adhesive. This fabric layering technique has been used to print items such as a 3D printed fabric bunny. The bunny was printed in layers using a solid square block of felt, then each layer was pulled apart to reveal the fabric bunny shape. The material of the bunny object was very flexible, however the layers were also very visible. Disney Research also looked at making objects using two different materials which involved swapping out a layer of fabric with another fabric material as the object was being printed. They demonstrated this by making a toy doll from cotton and fleece and one from white and red felt. The most innovative part of this 3D printing experiment was the concept of using conductive fabrics with non-conductive fabrics to create soft, interactive objects which are electronically functional so that objects can have built-in touch sensors or embedded 'wiring'. These can be printed using the same method for two different materials. Experiments also included printing a starfish which had an embedded capacitive touch sensor and a smartphone case with an embedded circuit that lights up an LED by receiving energy from NFC (near field communication) hardware of a phone. Recently, 3D printed clothing and accessories have shown up more frequently on high fashion runways. 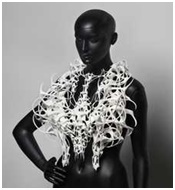 Dutch designer Iris van Herpen started using 3D printing in her collections in 2010. In 2011, Time Magazine named van Herpen's 3D printed dress from her collection "Escapism" one of the 50 Best Inventions of 2011. The dress was revealed during Haute Couture Week in Paris Spring/Summer 2011. Since 2010, van Herpen has used 3D printing in most of her collections and has created many different types of clothing, jewelry, and shoes from 3D prints. At the 2013 Paris Fashion Week, van Herpen debuted hew new collection "Voltage". The Voltage collection consists of two 3D printed outfits. The first outfit included a skirt and cape, 3D printed in collaboration with Neri Oxman from MIT's Media Lab and printed by Stratasys, a major 3D printer manufacturer. The second ensemble was a dress designed with architect Julia Koerner and 3D printed by Materialise. For the second ensemble, van Herpen and Koerner used Materialise's Mammoth Stereolithography machines. The dress's lace-like texture was created with precision using a process known as Selective Laser Sintering (SLS). In her most recent collection "Hacking Infinity", released during the 2015 fashion week, van Herpen showcased her classic heelless platform shoes with 3D printed crystals. Every year Victoria's Secret has their annual fashion show which debuts their newest items while also featuring some of the world's top fashion models. In 2013, the fashion show featured a 3D printed pair of angel wings and a corset worn by model Lindsay Ellingson. Victoria's Secret partnered with architect Bradley Rothenberg and Swarovski to design the wings, as well as Shapeways to 3D print them. The 3D printed wings were designed using a computer algorithm that mimicked the crystaline shape of snowflakes after a 3D body scan was taken to ensure that the outfit would fit. Shapeways printed the wings using a laser sintering method with nylon to generate the wings around the model's body shape. The whole outfit was printed as separate, interlocking pieces which varied in thickness. The precision and detail required to create the whole outfit could only come from a 3D printer. As the 3D printing industry continues to grow and flourish, new innovations are growing continuously. Fashion designers are incorporating new ways to use 3D printing in their collections and soon enough, the average American will begin to own clothing that is 3D printed. Federal and state tax credits are available to support these innovative efforts for 3D printing for textiles.